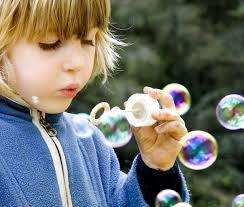 Homemade bubbles are fun activities for kids & adults! 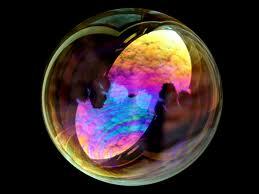 A bubble definition is, "a thin sphere of liquid enclosing air or gas". 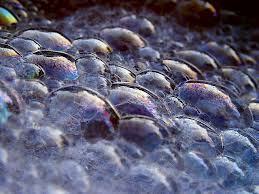 Bubbles have an inner and outer surface. Its surfaces are separated by a wall, a few millionths of an inch thick. Look closely to see beautiful colors. These colors are similar to a rainbow. Bubble colors are caused by reflecting and refracting light waves. When a light wave hits a bubble, part of it is reflected back from the outer surface and part of it is reflected back from the inner surface, to the eyes of the beholder. When reflected and refracted light waves interfere with each other, colors will appear. 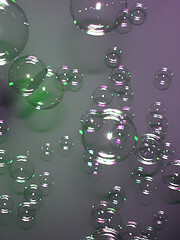 Bubbles reflect colors from their environment or surroundings. Colors are intense when light waves reinforce each other. Colors are faint when light waves cancel each other out. As the bubble surface wall becomes thin, colors will disappear until nearly invisible. When you're making soap it's impotent to decide what properties you want. Do you want soap with large bubbly lather or creamy stable lather? Maybe making lather doesn't matter to you at all. Maybe you just want a homemade soap that's super mild and gentle, especially for sensitive skin. Choose the right soap making oil to get you to your goal. (These soaping oils add strength to soap and increase conditioning). Castor Oil can produce fluffy and creamy lather with conditioning properties. Caution, though, it produces a very soft bar of soap. Do not use too much in your homemade soap recipes! A little bit goes a long way. A small amount, less than 10%, will be plenty. -- Fill jars with water to half full. Add a couple drops of food coloring to both jars of water. Add canola oil to both jars, leaving some space at top. Add liquid soap to one jar only. Add lids to both jars then shake until contents are mixed well. Set both jars aside. -- Watch both jars closely. You'll start to see a difference in their appearance. In one jar, the oil and water separates. On the other hand, the jar with the liquid soap, oil and water remained mixed together. This science experiment proves some molecules are attracted to water and others are repelled by water. Soap has hydrophillic molecules, (attracted to water) and hydrophobic molecules, (repelled by water). The jar with the liquid soap stayed mixed together because soap is a long molecule. Soap has one hydrophillic end and one hydrophobic end. Water bonded to the hydrophillic end and oil bonded to the hydrophobic end. Soap remains in the middle. At this website, we have fun with bubbles! We even had a homemade bubbles contest! Be sure to read the winning entry, "BUBBLE SNIPER". Deborah Johnson, from Connecticut, tells her funny story! Who can blow the tiniest or largest bubble? Who can make their bubble float in the air the longest? Who can pop the most bubbles? Fill an outdoor baby pool with soapy water. Place a hula hoop in the soapy mixture. Raise the hula hoop, carefully, holding it upright. Children can run an jump through the hula hoop popping the large bubble. Also, try stepping into the bubble and see if it will stretch. Add water based color to bubble solution. Have one person hold construction paper, cardboard or any type of thick paper. Have other person blow colored bubbles. The person holding the canvas should try catching the floating colored bubbles. As the bubbles pop on the canvas a colorful design will appear. Let dry. Frame and display the colorful bubble art. Kids will be proud of their artistic bubble creation! Kids love chasing and popping bubbles! Great for outdoor parties!